When it comes to the extremes we’ll go to achieve someone’s arbitrary ideal of beauty, at least these light-up eyelashes aren’t permanent. We’re not sure if they’re meant to be facetious or an earnest effort to pander to Asian women who desire to make their eyes appear bigger and/or look like a refugee from a sci-fi Cosplay convention. 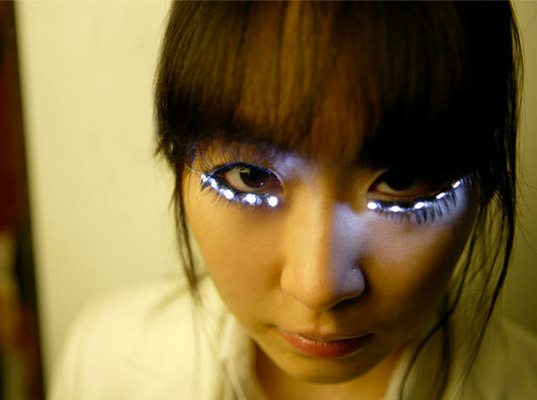 We’ll admit to one cool touch, however: The LED lashes are equipped with inclination sensors that track movement, so you can turn the lashes on or off by tilting your head. Click below the fold for an…um…illuminating video. just what we need - another way to spread mercury around? seems neither "eco," nor "terre," nor cool.... pretty, yes. A brilliant idea. Especially for night bike riders. Mercury? I don't think so~ wow the lady with the first comment is way out of touch! When it comes to the extremes we'll go to achieve someone's arbitrary ideal of beauty, at least these light-up eyelashes aren't permanent. We're not sure if they're meant to be facetious or an earnest effort to pander to Asian women who desire to make their eyes appear bigger and/or look like a refugee from a sci-fi Cosplay convention. We'll admit to one cool touch, however: The LED lashes are equipped with inclination sensors that track movement, so you can turn the lashes on or off by tilting your head. Click below the fold for an...um...illuminating video.